The Nubia Z9 Max and Nubia Z9 Mini have been out since April, and now, half a year later, it looks like ZTE felt it was time for an upgrade. So the Chinese company has apparently been working on refreshing these two models somewhat, without changing the overall design or most of the specs. What will result from this process are the ZTE Nubia Z9 Max Elite Edition and the ZTE Nubia Z9 Mini Elite Edition. The existence of these devices has been leaked in China today, thanks to promotional flyers for both, which you can see in the images below (click the thumbnails for full size pictures). 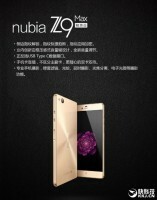 The Nubia Z9 Max Elite will gain a fingerprint sensor embedded in its side-mounted power button. It's also going to get a USB Type-C port, to keep up with the latest trend in the mobile world. Otherwise, though, it will be identical to the non-Elite variant. Hence, it will feature the same 5.5-inch 1080p touchscreen, 16 MP rear camera, 8 MP selfie snapper, Qualcomm Snapdragon 810 chipset, 3GB of RAM, 16GB of expandable storage, and 2,900 mAh battery. 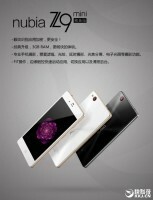 The Nubia Z9 Mini Elite will come with 3GB of RAM, up from the non-Elite iteration's 2GB. It will also have eye pattern recognition, and a couple of other new software features. No further hardware changes, though, so it will still have a 5-inch 1080p touchscreen, a 16 MP rear camera, an 8 MP front-facing unit, 16GB of expandable storage, the Qualcomm Snapdragon 615 SoC, and a 2,900 mAh battery. Expect both of these to launch in China soon. As usual with ZTE's Nubia line, it's not extremely likely that you'll ever be able to officially purchase them overseas. Have you faced any battery issues?? It looks like the Sony Xperia Z5, also with fingerprint sensor at the side. I am sure its gonna be a awesome smartphone! I have the Z9 Mini and its one of the best gadget i have used among many vendors. ZTE rocks!